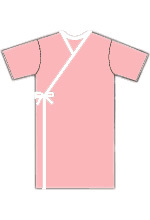 Information on Hospital gowns Click here. Regular hospital gowns simply fail to make the grade for those who work with large and plus size patients. These gowns generally fail to cover the client completely, making them feel uncomfortable and embarrassed. Patients need to be as comfortable as possible and bariatric hospital gowns take care of this issue, helping your patients to feel that they retain their privacy and dignity when in a hospital gown. Bariatric hospital gowns come in a plethora of sizes, allowing you to meet the needs of all of the patients who come into the hospital or physicians offices. The gowns are designed with the size of the patient in mind, coming in sizes that range from 3X to 10X. Patients will be able to fit into a gown and will be able to avoid any possible embarrassment. One of the issues that many patients have with hospital gowns revolves around the actual closure of the gown itself. Patients are often given gowns that fail to close completely, making them feel uncomfortable and awkward in their hospital or physicians office examination room. Bariatric hospital gowns resolve this issue by making sure that the gowns close with ease. Many gowns have moved to side-ties this makes the gowns easier to close for the patient and helps to make sure that the patient is secure and comfortable during their time in the examination gown. When purchasing hospital gowns, texture and feel are also things to take into consideration, working to meet the needs of both patient and caregiver. The gowns should be made from durable fabrics that are meant to last, providing hospitals and physicians offices with the reusable gowns needed to keep costs down. All of the thought into fabric color, pattern, and texture helps to ensure that patients are as comfortable as possible through both look and feel. At Personal Touch we bring together the best collection of these gowns for you to choose from, helping to ensure that your patients feel secure. 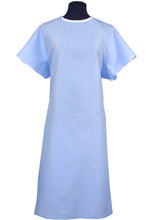 You can find all of our oversized hospital gowns quickly and easy at www.Adaptiveapparel.com. Within minutes you’ll be able to choose the right oversized gowns for your hospital or other healthcare facility.